If you are short on time, the following 3 questions should let you know all you need to about the Arm & Hammer Spinbrush. If you prefer more detail, you can read our full Spinbrush review below. It cleans the teeth, but there are better options available, when you consider everything. We list some of these in our best battery toothbrush 2019 post. To be fair it is one of a select few of removable battery powered brushes and is cheap, which you can’t really argue about. But I believe people want the best they can get for their money and I am not convinced that this is it. Unless you need a toothbrush with removable batteries, there are many benefits to opting for an electric toothbrush with a built in rechargeable battery. Check out the other suggestions in our post on the best rated electric toothbrushes. If you particularly want a removable battery powered brush then it is well worth investing in the Fairywill 959 or the TempIR SonicWave, which took the top spots in our list of battery toothbrushes. 3. Where’s the best place to buy the Spinbrush? Our price comparison table below shows some of the cheapest online stores (although you may find that the version on offer varies) and it’s always worth checking out eBay, too. Most electrical toothbrushes have a built in battery, that requires recharging through that brands own particular charging stand. The Spinbrush from Arm & Hammer on the other hand is one of just a few models that relies on power from user removable AA batteries which gives a certain level of convenience. There are several different models/versions of the Spinbrush. It is my understanding that there are 6 main model variants. It is not made particularly clear on Arm & Hammers own website as to what the differences are, but the key difference is the style of brush head supplied with the brush handle. Extra variants and models if you like come from the fact that some are available in different color choices. There are potentially even more models labelled Truly Radiant, in what appears to be a revised version of this brush with a slightly refreshed design and different brush heads. Quite honestly the whole range is very confusing. In this review I am testing the Spinbrush Pro White. Here are what I believe to be the advantages and disadvantages to this battery powered toothbrush. Whilst there may well be many different variants of the Spinbrush, it is the Pro White in particular that I am testing. I do too wish to make clear that back in 2011 some models of the Spinbrush were recalled. This may raise come concerns for you, but this recall was terminated in 2015 with all affected units having been dealt with. That means this unit I am reviewing and any new model purchased will not be affected. All of the Spinbrush models are designed to be basic and functional and I can’t say that this really catches the eye. Depending on when and where you buy this from, will depend on the color choices available. From Blue to Red to Green there is an array of choice to find one that matches your personality. Although mostly plastic in construction if feels fairly solid and well built. On the front of the brush handle is a simple slider that turns the brush on and off. Can’t really fault this, easy to use thanks to a grove in the slider to make it easy to hold onto. Just above the power button is a thumb rest, that works well in practice and the main body of the brush is contoured for grip and design. This particular model is finished in a metallic silver blue color with the base and rear being a glossy White. With the exception of the power button, the body of the brush is smooth to the touch and although fairly easy to keep hold of due to the size, if it gets wet the lack of grip is not ideal. Models such as those from Oral-B feel more secure in the hand. The base of the brush is removable, and it is within this that the 2 x AA batteries sit. A small rubber seal then stops moisture getting into the compartment. Only time will tell how well the seal holds up but several weeks of testing and close observations give no real cause for concern. The removable base section has contoured grips to assist in removing the compartment, but it is not particularly easy even with two hands. You need a good grip and a bit of force, which is perhaps a sign of the strength of the brush?! I can see that some might buy this for younger children or ageing parents. It you expect them to remove this cover, they may find it a bit difficult. When the compartment is fitted back a small gap exists between the 2 pieces and it can get a bit dirty in there quite quickly. Just something to be aware of. The 2 x AA batteries needed to power this might be convenient, but there is no power feedback from the brush handle. Unlike more expensive brushes that have LED’s that feedback the remaining power this does not. You only know its run out of power when the motion slows or stops. The brush head itself is quite large in comparison to heads I have seen and used on Oral-B and Philips brushes: it is more reminiscent of a manual brush head. It is dual action head does in part have some bearing on this. What is interesting is that some much older Oral-B models did have a similar style of brush head, that they have moved away from. The dual action brush head offers side to side spinning on the upper part of the head, whilst the lower offers up and down cycles of motion. The top part of the head doesn’t rotate all the way around. The head oscillates back and forth because circling in the same direction, according to Arm & Hammer, would cause Spinbrush bristles to lean to one side and helps extend the life of the bristles and provides a better clean. It moves up to 3,7000 times per minute. Far more than a manual brush, but far less than Sonicare brushes at 31,000 and even the super slim Quip offers 15,000 movements per minute. After use my teeth felt clean, but not as fresh and clean as they do after the more powerful electric toothbrushes have been used. This might be psychological, but that is how I feel. Able to remove more plaque and subposidly whiten teeth within just 7 days, I could not confirm either. Having been a long time user of electric toothbrushes and being reasonably careful about what I expose my teeth to, I am perhaps not the ideal candidate to achieve such results, but I am not sure that many will see much noticeable impact unless the routine prior to use was particularly poor. In this particular case, the bristles on the brush are of a medium rating, but feel a little stiff and hard for me. Whilst it has caused no long term irritation it has taken a little getting used to and feels at times a little harsher on the gums than I am used to. Many dentists will recommend soft bristles. The brush head is to be used twice a day and should under normal circumstances last about 3 months before it needs replacing. To remove and replace the head, you need to turn it 90 degrees to unlock it from its fastening. This actually feels more secure than some of the more premium brands where they just pull off with a little force. The brush is a fraction noisier than I had expected, a bit of a mechanical clattering sound, but I am being a little critical here. One thing I have gotten used to on other brushes is a timer be it visual or audible to indicate to me a 2 minute cycle that is recommended by dentists. Most do too have a built in pacer that alerts you at 30 second intervals to change the area of the mouth you are cleaning, so that you achieve an even all over brushing. The Spinbrush does not have a timer or pacer. I guess you can rely on a watch or clock like you would a manual toothbrush, but I think it is such a basic feature of an electric brush its a real shame the timer at least is not included. Arm & Hammer suggest that if you brush for 2 minutes twice a day, you can expect the batteries in your Spinbrush to last about 4 to 6 weeks. Well either I had some incredibly powerful batteries or a super efficient brush because I got a lot longer from the batteries that came provided. It will always depend on each user, their brushing time and technique, but I managed to achieve an incredible 540 minutes of usage time. This is equivalent to 270 teeth cleaning sessions. Enough to last 135 days or approx 4 months based on two cleans a day each lasting 2 minutes. I see little value in buying expensive batteries for this brush unless you know they are going to deliver remarkably better usage time. Using rechargeable AA batteries (you would have to buy separately) could be an option, but this is another expense and would take away in some respect one of the appeals of this brush. Prices are always subject to change and do vary depending on when and where you buy it. The suggested selling price is just $10. That includes the handle, the head and 2 x AA batteries. Some brush heads from the leading brand cost more than this alone! At the time of review, prices ranged from about $6-10 – we have included a live price comparison here. Therefore you may save a little bit, but not huge discounts given the already low suggested selling price. A set of 2 replacement brush heads have a value of about $10, making each brush head work out at $5 each. I saw little in the way of discount here, maybe a $1 off, not much more. Feels a bit crazy that you have to pay almost the same price as a new Spinbrush to get replacement heads, but I guess this is where Spinbrush make their profit, on the heads, not the brush handle. You should replace the heads every 3 months on average. I mentioned the varying styles of brush heads. Getting the same style that came with your brush might be difficult and you may need to shop around. The good news is, any of the different style heads fit on the handle, so you don’t need to stick with the same ones. Batteries will deplete over time too, so this will need to be factored into the cost of buying and running this brush. Whilst my usage would suggest a battery life of 4 months, let’s err on the side of caution for the moment and say a set of batteries last 3 months, then you would need to replace them 4 times in the course of a year, resulting in a cost of up to about $4 per year. As a typical cost of ownership calculation, I like to price brushes over a 3 year period to get an idea of what it might cost. Total – $74 or $24.66 per year or $0.07 per day. 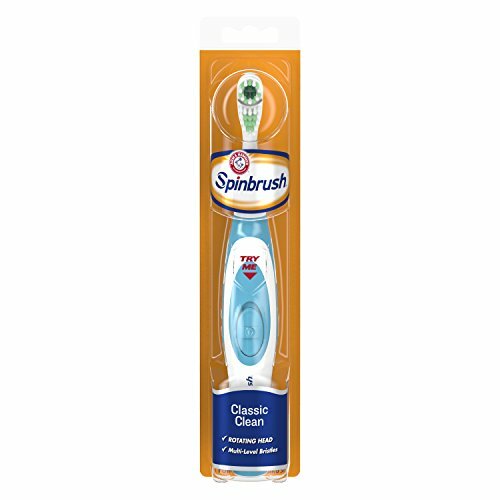 For the sake of comparison although technically different to the Spinbrush, what I would consider a more premium Oral-B Pro 1000 works out at just $0.07 per day and this offers better features and cleaning in my opinion. I think a brush with a fixed internal battery like the 1000 is a better choice, but if you really want removable batteries, then why not check out the Oral-B Pro-Health Clinical or my recommendations for best battery toothbrush, I think you might like some of the choices. At the time of writing I have had the Spinbrush on test for a number of few weeks. So far the brush is proving reliable, no faults have occurred, it still functions and it feels solid in hand. It is noticeable that moisture and grime builds up in the very small split in the chassis of the brush where the battery compartment adjoins to it. Whilst I rinse the brush and dry it reasonably well, within only a matter of days there is a build up that needs cleaning. This could go on for months, or the very small seal inside could give up quite easily, I fear the latter. I would like to give you a definitive time frame, but it will depend on how thoroughly you clean and look after your brush. The number of movements of the brush head and the consistent power an electric toothbrush can bring, can be beneficial. If you are wishing to try an electric brush, then this does offer an option without too much upfront spend. Being powered by conventional AA batteries is a real win should you be away from fixed power for a long time or simply do not want the hassle of having a charging dock. The lack of a timer and pacer are a real disappointment though given so many brushes offer this. A confusing range of different but very similar models does not make your choice any easier and sourcing brush heads can be difficult. There are though better brushes that you can buy, notably the Fairywill 959, winner of the best battery toothbrush. Do you own or have you used the Spinbrush? I’ve owned many a A & H Spinbrush for the last 8-10 yrs. For the most part, I’ve been happy with the Spinbrush. Usually, I need to replace the toothbrush every 2+ years. The batteries last 4-6 months. I change the heads every 4-6 months. However, this last Spinsbrush lasted a mere 5 months: I believe the seal is gone and complained to A & H. Supposedly, they are sending me a prepaid envelope to return the product and will give me a coupon good for a new Spinbrush. I have read the reviews and found them very helpful. I don’t have an extra outlet in my bathroom to charge a toothbrush. Hence, I purchase a battery operated one. This could be a good electric toothbrush. It is incredibly difficult to remove the bottom of the handle to put in batteries. Should not be that difficult. I bought the Arm and Hammer spin brush and my husband was using it the first time and it had lots of power and it just stop working. I will return it back to Walmart for a refund and will not buy anther one! I bought my wife one for Christmas and after using it 3 times it just quit working. I replaced the batteries and still nothing happened. I will not be buying this product again since it does not hold up for more than a week. Might be worth trying to return it?! I will not be buying Spinbrush again. Its initial work is great, but then there’s a battery issue. The battery dies and I have tons of replacements…but as an environmentally conscious human I used rechargeables. They don’t fit! Apparently they’re just a tad larger in circumference (not height) then trad’l batteries and so they jam in the replacement holder! The first time it happened I thought maybe my strength or grasp wasn’t good enough, but hubby couldn’t do it either. So I went and used the second toothbrush in the pack. The same thing just happened. Battery wore down, new batteries won’t work! Apparently A&H isn’t truly environmentally conscious. Won’t be buying these again. Shame ’cause they did great work.